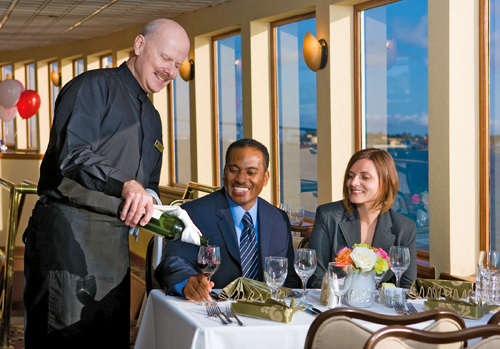 Featuring the only floating Newport Beach restaurant, Newport Beach Dining Cruises by Hornblower Cruises & Events offers unforgettable dinner cruise experiences for a variety of occasions. Guests celebrating a birthday, an anniversary or another special occasion can enjoy two tour options, including a casual daytime outing or a formal sit-down dinner, both featuring enchanting music and fine wine. Choose between day and night cruises. Dinner service and live entertainment included. Dinner service begins immediately upon embarking. 3 largest yachts in Newport Beach. The Only Floating Newport Beach Restaurant! Whether the highlight of a California vacation or a close-to-home birthday party, anniversary dinner or special celebration, a Hornblower Cruise is always memorable. 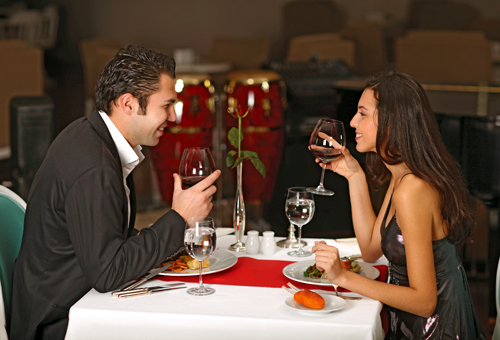 Tour options include casual daytime outings and formal sit-down dinners complemented by music and fine wine. 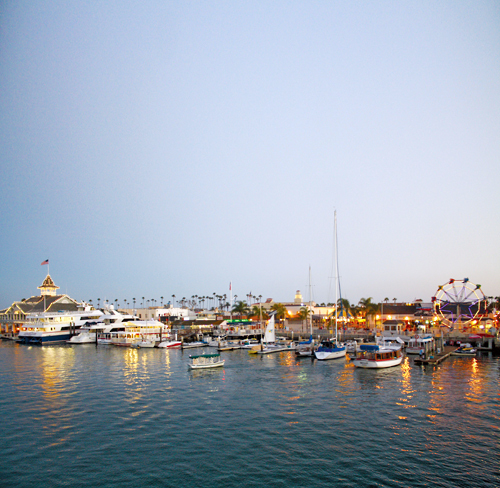 A Newport Beach cruise at sunset is unforgettable—and you can enjoy its glorious sights and sounds from the comfort of a luxury yacht. Begin your evening with a welcome glass of champagne. Then sit down to a delicious four-course dinner crafted from local, seasonal ingredients at your private table. After dinner, head to the outdoor deck for music and dancing under the sparkling night sky. As we glide around the harbor, you’ll be treated to views of Southern California’s beautiful beaches. Listen to the barking of the playful sea lions, and spot the towering yachts and sprawling mansions. It’s the weekend, and that means it’s time for a relaxing, beautiful brunch. Set off from glorious Newport Beach, where sunlight bounces of the water and soft sea breezes stir the air. 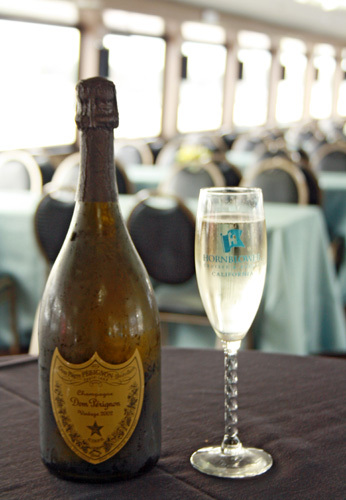 We’ll welcome you aboard with a bottomless glass of champagne. Then help yourself to the delicious buffet stocked with classic American breakfast dishes, plus plenty of seasonal lunch entrées and richly decadent desserts. You’ll enjoy relaxing background music and gorgeous views of Newport Beach’s seven islands, luxury yachts, celebrity mansions, and delightful sea life. Join us for a midweek escape on our exclusive 2-hour sunset cruise, and enjoy cozy inside seating and outdoor decks open to the evening sky. Enjoy a variety of appetizers and relaxing music as you take in the spectacular views, and get a front row seat to take in the local sailboat races. If one or more people in my party are not able to make it or we miss the cruise departure time will we receive a refund? No. Once payment is received cruises are non-refundable. With a 48-hour or better notice we will be happy to reschedule your cruise date or issue a gift certificate for the amount paid. Cruises are non- refundable and non-transferable within 48 hours of your cruise. We do not compensate for no-shows or late arrivals. A service charge is collected at the time of reservation, related to the cruise and the service included in the ticket. If you wish to purchase additional beverages or food enhancements onboard, we recommend you leave a gratuity onboard based on the quality of service provided to you by your server. What happens if it rains or snow? Hornblower sails rain or shine. In the case of severe weather conditions or upon the direction of the U.S. Coast Guard, we will remain dockside, but provide the full dining service. Are there any age restrictions on your cruises? There are no age restrictions for most of our cruises. All minors require adult supervision. Please call with questions about any of our special event cruises, as minors are not restricted, but the cruise may not be appropriate for all age groups. Do you offer any children discounts? Children under 4 are complimentary. What is the dress attire for the cruises? 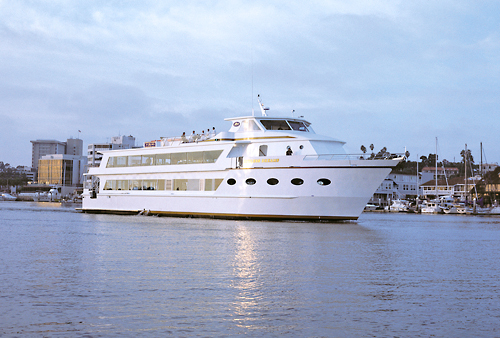 Lunch and Brunch Cruises: We recommend California casual attire, such as khaki pants and collared shirts. We request no shorts, tank tops, flip flops, or gym shoes. Dinner Cruises: Business casual to dressy casual attire is recommended. For men, slacks or khaki pants, and a collared shirt with or without a jacket; for women slacks or skirt, with a collared shirt, or dress. We request no jeans, shorts, tank tops, flip-flops, or gym shoes on these cruises. You may find that some guests are dressed more formally, especially those celebrating special occasions. However, attire varies from comfortable shorts to the more formal. Bring along a light jacket or wrap as it may get a bit breezy on the outer decks. What time do I board the ship? Boarding time is usually 30 minutes prior to departure for all cruises. Please check your boarding time when making your reservation. Smoking is allowed on the outside decks only with the exception of Harbor Tours and Whale Watching Cruises. Please dispose of all refuse in proper receptacles. Do not throw anything into the water. Please help us keep our harbors clean. Is there pre-assigned seating for dinner cruises? As you board, our captain and marine crew will direct you to your deck. From there the host/hostess will show your party to your assigned table(s). Decks are never guaranteed to non-private groups. We assign seats based on needs and capacity for each cruise. Will I get my own table? On the majority of our cruises, we assign private tables to the individual parties. However, on some of our cruises, we do have cruise-style seating, where we will ask you to share a table with other parties. If this is the case, you will be told if this is the case at the time you make your reservation. What kind of entertainment is on board? Hornblower offers inviting dance floors and a variety of music, from the dance hits of the 40's through today as well as a variety of jazz, standards and popular favorites. Depending on the cruise, it may be background music, a DJ or a live band. Please check online or ask one of our reservations agents for more details about the planned entertainment for your specific cruise. Can we meet the Captain and visit the pilot house? Yes. Guests are welcome to come and meet the Captain and the First Officer. However, for safety and security reasons, we ask that you check with our staff onboard before visiting the pilot house. We want to ensure that all passengers and crew are kept safe and that the captain is not distracted while performing essential duties. Are there vegetarian options available for dinner cruises? Can I make a special menu request? Yes, for dining cruises, vegetarian meals are available and can be arranged at the time of booking. If you have a group with many vegetarians or if you have vegans, please notify a reservations agent at the time of booking. If you have food allergies or other dietary restrictions, please let your reservations agent know at the time of booking. We can also accommodate most other special dietary needs with advance notice. For dinner cruises, when does the meal begin? Do we need to pre-select the menu before the day of cruising? No, you do not need to pre-select your menu. Some of our cruises have multiple entrée options and we have a menu that you will chose from onboard. For our other cruises, we either have a preset menu or offer a buffet with a variety of options available. Can I bring cakes and flowers on board? Cakes may be brought on board, however you will be charged a $1.50 per person cake cutting fee. Cake cutting fee for wedding or tiered cakes is $3.00/per guest. Small flower bouquets are also permitted. Please keep in mind you are on a ship, so top heavy arrangements will not be stable. Unfortunately, an early boarding is not available. What decor does Hornblower provide? All Hornblower yachts are decorated with linens, votive centerpieces, silver, and china. Are you regulated by the U.S. Coast Guard? Our vessels are all subject to inspections by the U.S. Coast Guards and our crew are all properly licensed. We also follow Marsec security guidelines. Should the Marsec security level be elevated, we may opt to increase security measures onboard our vessels to insure everyone’s safety. The U.S. Coast Guard requires all passengers over 18 years of age to have valid photo identification. Please make sure to have your photo ID available at boarding. Are life preservers on board? Each vessel is 100% Coast Guard certified with life preservers and all required lifesaving equipment, including child life vests. Is the ship handicapped accessible? Hornblower does have accessible yachts in the fleet. However, not all yachts and decks are accessible. Please call 888-467-6256 to ensure handicap accessibility for the date you are planning to cruise. The vast majority of our guests experience no discomfort at all as we do not leave the calm waters of the harbor. If you tend to have a problem with motion sickness, you may experience seasickness. If you are sailing on one of our whale watching cruises, we do go out into the open ocean and as a result, the chance of getting seasick increases. For these cruises, we recommend that if you are prone to motion sickness that you take advantage of a number of preventative measures that are available to you. In Newport Beach, we are located at 2431 West Coast Highway, Newport Beach, CA 92663. We do not validate for parking.